Review: "Love the simplicity of Really Simple Systems!" I used Really Simple Systems for my personal use for my Customer Relationship database. I find it extremely user friendly and the classes are very helpful. I look forward to them considering merging with Quickbooks. I find Really Simple Systems very user friendly, it truly is 'really simple' but very comprehensive and provides all that one needs to have a complete customer relational database for my business. The Webinar trainings are very helpful and provide detailed information to utilize all the aspects of the program to its potential. Phone support is very helpful and friendly. Really Simple Systems is perfect for following the sales cycle from prospect to sale. Love the customization capabilities for all forms. Review: "Left Sales Force to Really Simple Systems"
I chose Really Simple Systems out of DESPERATION! We have been a long-standing consumer of Salesforce here in the United States for YEARS, however the larger they have become, I found there are too many layers one goes thru to get good customer service. After spending hours chatting, leaving messages, getting frustrated at our account executive at Sales Force who did not respond, then going to his manager again and again - ALL with no results and 6 days of lost activity, I found Really Simple Systems! I initially chose to try it out for myself and had GREAT results. We will be introducing Really Simple Systmes to the rest of our organization and to a second company we run. The problem Really Simple Systems addresses for us is TIME and EFFICIENCY along with increased ROI's, now that we are not chasing people around from within Sales Force to fix our issues; simple things like our log in credentials not working or changing passwords routinely or they lock you out and even when you do change the password, their system doesn't work. Our Account Executive, Lisa, has been AMAZING! Her emails are always helpful. She is very attentive when helping us and she is FAST, which we never received at Sales Force despite being a long-standing customer. The Really Simple System IT department worked with our IT department to transfer or migrate our data off Sales Force into the RSS platform. I HIGHLY RECOMMEND! Customer Service is EXCELLENT! Fast response time, professional, and helpful. Platform is very intuitive and love the FREE WEBINARS they offer. Really Simple Systems gave us some ideas of how to use their product that we hadn't thought of ourselves. Very reasonably priced even at the Enterprise level, which we have chosen for our company. Add calendar so everything is inside one platform. Any business owner looking for a database/CRM, for example, we are business consultants, this is the SYSTEM TO USE! Really Simple Systems Review: "Should I stay or should I go?" Our small team is experimenting with various CRM systems at this time. I have selected Really Simple as one of the systems under evaluation. I'm using the system for the most basic applications as a contact and opportunity manager. At this time I don't see much value in going up to one or two tiers from the current free version. The most important issue that I need to resolve is the communication of the system and our corporate outlook. Currently, external connections are extremely limited to top security compliance. [It's well suited for] connecting opportunities to multiple accounts/contacts. For example, I have opportunities that are related to customers and "influencers" alike. There is a cross-pollination that should easily occur. There are multiple parties to an opportunity that must be related. Also, easy porting of contact and phone information to tasks. Really Simple Systems Review: "Best CRM for a Start-up Venture"
We currently use Really Simple Systems (RSS) to track all contacts (Sales, Distribution, Investors, etc.). We will expand use to marketing and possibly product development in the near future. Captures required information. Easily organized and accessible. No complaints. Maybe our marketing person could provide an opinion. Review: "Really Simple Systems Lives up to its Name!" We switched from a complicated CRM to Really Simple Systems. It lived up to its name. It has all the features we needed, is organized simply, and was easy to learn. [It's] Used in marketing and sales and addresses the problems of keeping up with leads and prospect communications. 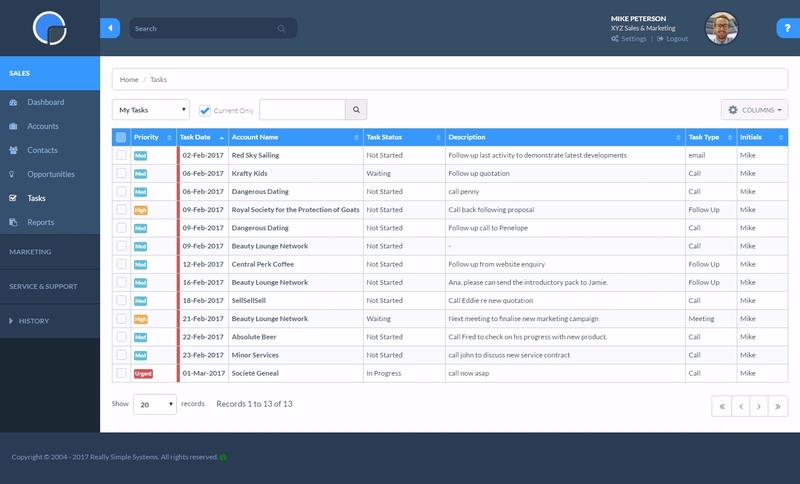 Really Simple Systems Review: "Excellent and honest feedback"
We use Really Simple Systems as a complete CRM and opportunities management tool. Whilst all members of Business Development team use the system on an hourly basis, the info and reports that are generated impact on the whole business. By using RSS is allows us as a business to forecast better but also it allows use to focus or re-focus attention based on fact rather than a gut feel. It has very much helped us to track and record the interaction with all clients. You the user are totally in control of the system so even now if we want to generate a new report or record a different set of info we can change and not wait for a call centre to come back to us in many weeks time. The help and support desk is EXCELLENT. When I email them I get an answer normally within one hour. They are spot on with the help but also with their advice about the best way to achieve what we are trying to achieve. The ability to change and produce reports that we as a business want and not simply having to work around a set of templates. It would be great if one could add field tasks and activities from the opportunity and it would be logged against that task and activity rather than having to go back out of the opportunity and then add it as a task or activity and having to add the name and opportunity etc. details. The software and support is totally geared to allow you to do your core function and is an aid to a business not a drag. Really Simple Systems: "Review from Events Venue"
Really Simple Systems (RSS) is being used to manage customer data for event enquiries and bookings at Murray Edwards College. Our enquiries come in and if we bid for them, we put the details onto Really Simple Systems. This allows us to understand more about the enquiries and customers themselves through analysis of this data, making for more cost-effective and targeted marketing and sales strategy. RSS also allows you to set task reminders which we rely on to chase the enquiry, ensuring we stay on top of this hot lead. Really Simple Systems Review: "Great for small business"
Really Simple Systems is currently utilized by our sales team, as well as accounts payable. We needed a straight forward platform that allowed us to share customer information across our organization in a uniform format. We were not looking for a program that integrated with marketing/email efforts and we did not want to pay for a system that had bells and whistles that we were not going to use. For our group, Really Simple Systems has thus far fit our needs quite nicely. Identifying tasks needed for each client and assigning due dates. These task due dates also integrate with Google Calendar, which is very helpful. They are a UK company. This becomes evident in some annoying little ways, such as when the British Pound Symbol next to dollar amounts shows instead of the dollar sign. Also when adding tasks to Google Calendar they default to GMT instead of the user's time zone. Other quirks come up as well, like when marking a task completed it requires a contact date to save, which is not necessarily applicable. This system is best suited for small companies who are not looking for large scale marketing and finance integration. Really Simple Systems Review: "RSS-better than your newsfeed"
Really Simple Solutions (RSS) is used as a true customer relationship tool. We use it to track opportunities and tasks for followup. Tasks - I would like to be able to add tasks without going into an account. RSS Has everything I need. I am not familiar with usage of this system in a larger format than our 2 person company. Really Simple Systems: "Beginner's Review"
I am currently the only one using at the present time. Planning to train everyone else at a later date. I use it for mass emails and keeping our clients in one program. It is easy to compile the information I am looking for. The feedback information on a mass email is great. Information is automatically sent to the client list (bounce backs as an example). It is a little difficult learning the system for sending emails. I took me a couple of tries to understand the format and how to send it. Some of my photos don't like to drag into the format. I think it runs well, I just need to learn how to use it. Really Simple Systems Review: "Not my first choice"
Really Simple Systems (RSS) is being used across the whole organization. 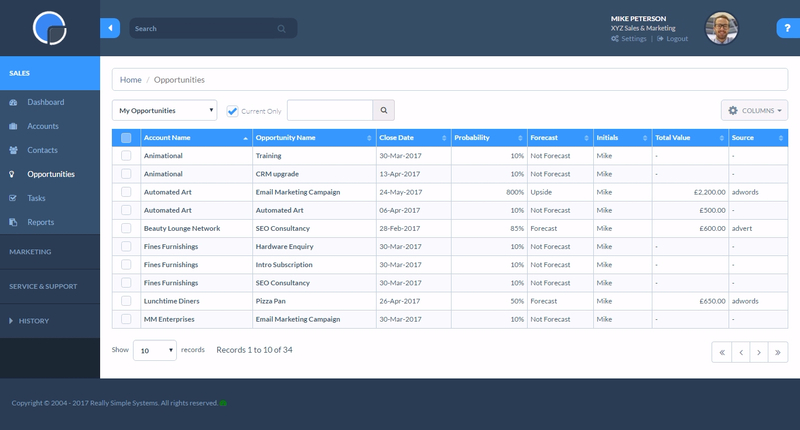 It is a fairly simplistic CRM system but the report options and the ability to enter quarterly data are not simple to use at all. The report screen is complicated and does not always work properly. More often than not, it provides zero results. It is very hit or miss, mostly miss. I have used SAP and more detailed medical CRM systems and they were a bit more user-friendly. 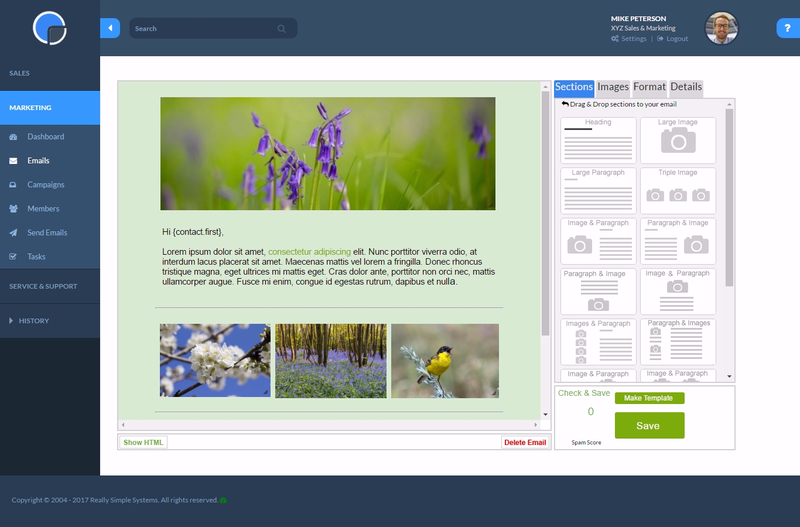 Report creation - The reporting format option could be made more user-friendly. Really Simple Systems Review: "Great Simple Sales and Lead Management"
I use Really Simple Systems to manage my marketing and sales. It is easy to use and very useful. I was able to get up to speed quickly. Really Simple Systems Review: "Top Class Service & Product"
Really Simple Systems is used to create a CRM Database for New and Current Clients/Projects. It is currently only being used for Sales. The customer support is EXCELLENT!!! Quick, Efficient and Friendly. There is no need to improve. You get what you pay for. Last week I asked for a whole list of changes to make it more bespoke. 1 hour later it is done. Review: "Really Simple Systems - Great for a small team that needs an out of the box CRM"
Really Simple Systems (RSS) is being used by my organization for the business development team. Six total people use it to track outreach for more than 1000+ contacts. It isn't completely specified to what we do, but that is fine given that it is an "out of the box" system. Really Simple Systems is perfect for a small team that needs to track contacts and outreach. Once you expand upon 5+ people, I think you should look to invest in a larger system, however this may not be necessary. Review: "Really Simple Systems - does what it says on the tin!" Really Simple Systems is used by a client of ours. It is my job when on site to use the software to load in contact details into the database and to keep a complete record of their details. We use the marketing module to send out regular news articles to target groups of clients. Simple easy to use campaign designer. Campaigns are easy to build and there is scope to add in your own images and detail. Campaigns can be sent to specific groups of people allowing us to target certain industries or areas. Running reports are very useful. The database can be customised so that only information you wish to capture is entered into the database. Entering the correct criteria to run a report can be tricky. Adding contacts to the database can be a slow process as there are so many fields to fill in. I have used Really Simple Systems to add company contacts into a database. We use the marketing module to design and import data and send out regular, targeted communication to certain industries or clients. Really Simple Systems Review: "CRM"
It is being used across the whole organization, sales and marketing primarily. It helps us keep all client data and marketing information in one spot. The marketing module is easy to use for mass emails. Really Simple Systems CRM is designed for small and medium sized companies or departments of larger organisations doing business to business sales. According to the vendor, the product is a simple and easy-to-use online CRM sales, support and marketing system. 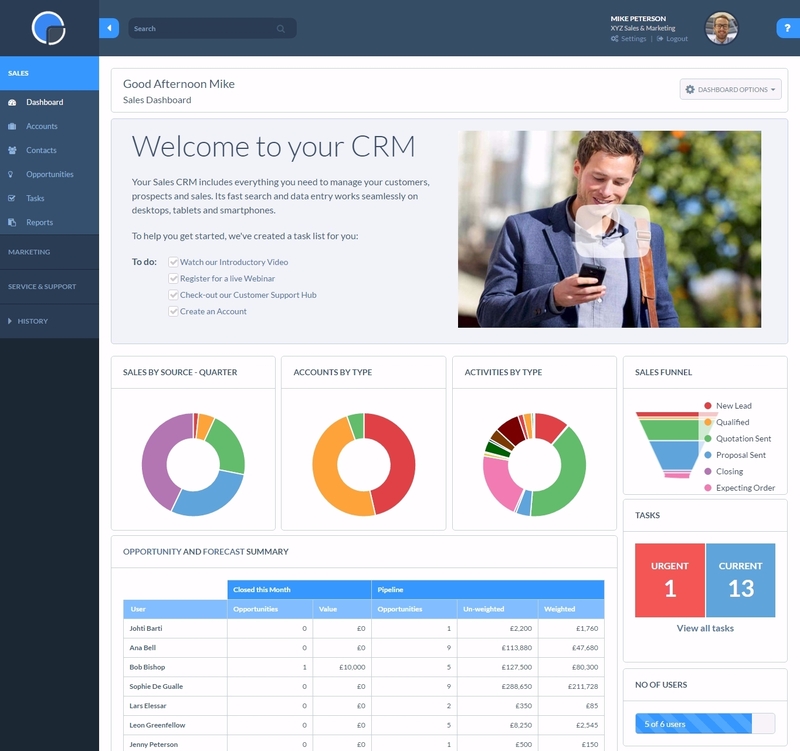 The CRM is cloud based making it suitable for companies with multiple locations and people who work remotely or at home. Founded in 2006, Really Simple Systems had over 18,000 users. 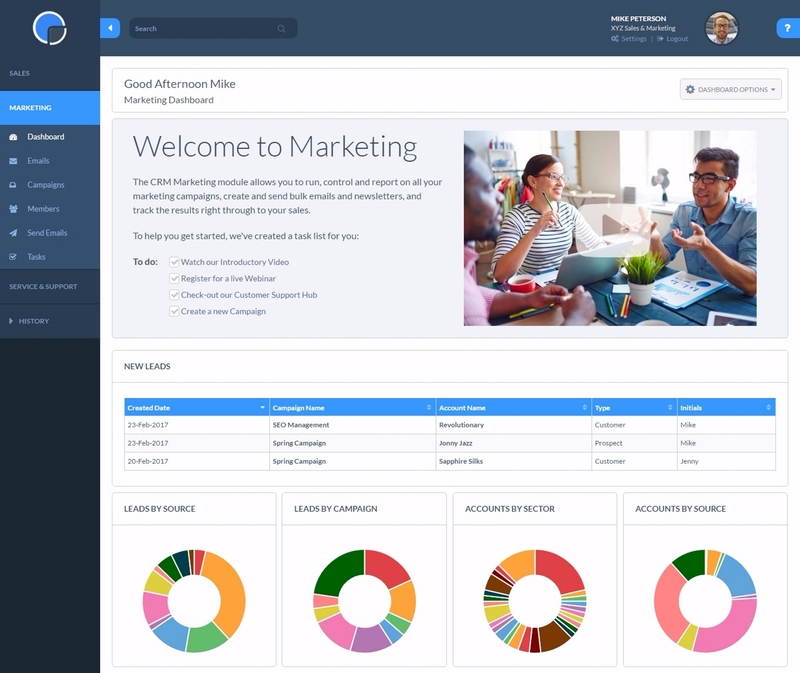 With the integrated email marketing module, users can build marketing campaigns and send emails and newsletters directly from the CRM system.